60 years ago rain gutter roof rack attachment was common place and roof rack selection was simple. Today great diversity exists in passenger vehicle roof types. 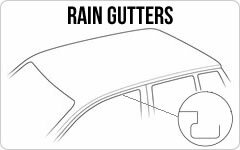 Rain gutters still exists on some late model vehicles but typically they're only found on full sized cargo or passenger vans. The cross bar system is relatively simple and just requires the load bars and gutter foot pack. 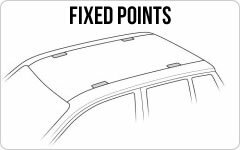 Thule does offer three heights to choose from depending on roof clearance requirements and two specialty rain gutter foot packs. 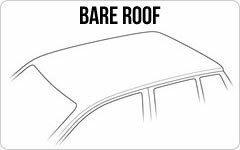 The most common roof type in late model vehicles today is the bare roof and this is the case because most vehicles on the road are cars and trucks and generally those vehicles simply have a bare roof with no factory pre-installed rack. This is where Thule's experience shines. Since every vehicles roof contours and door frame vary, Thule designs kits to interface between the Thule foot pack and the vehicle. Vehicle specific shaped rubber bases and rubber coated metal brackets customize the foot pack for a precise, positive and protective connection. The next most common roof type is the raised side rails found on the majority of SUVs, wagons and mini vans. 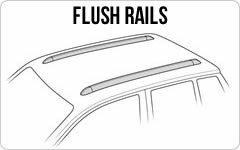 Raised rails are the stylish factory installed roof attachment that runs from front to back on the outer edges of the vehicle's roof. Connecting a cross bar system to raised rails is quite simple and does not require a vehicle specific fit kit, just the load bars and foot pack. Raised rails offer the versatility to choose the optimum cross bar placement along the raised sections for a wide variety of loads to be carried. The newest style of rail design has recently been introduced on many European makes, these rails are flush to the roof without any space between the rail and the roof. There is typically an inconspicuous inner and/or outer groove that allows connection of a cross bar system. 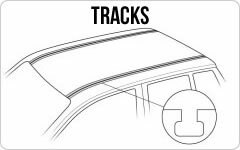 Thule uses a special set of fit kits specifically for flush side rails to provide precise integration to the rail. They look great, and are functional. Flush side rails offer the versitility to choose the optimum cross bar placement base of the load that is to be carried. Tracks are another type of roof rack connection. Tracks run from front to back on the outer edges of the vehicle's roof. Tracks are parallel to each other and have a channel for attachment of a cross bar system. The channels offer versatility in positioning of the cross bars from front to back along the length of the tracks. Some vehicles and some camper shells come with tracks installed at the factory. Thule Top Tracks can be custom installed onto truck fiberglass camper shells tops and sheet metal roof tops as well. These attachment methods require drilling and offer an excellent solution when other attachment methods are not available. 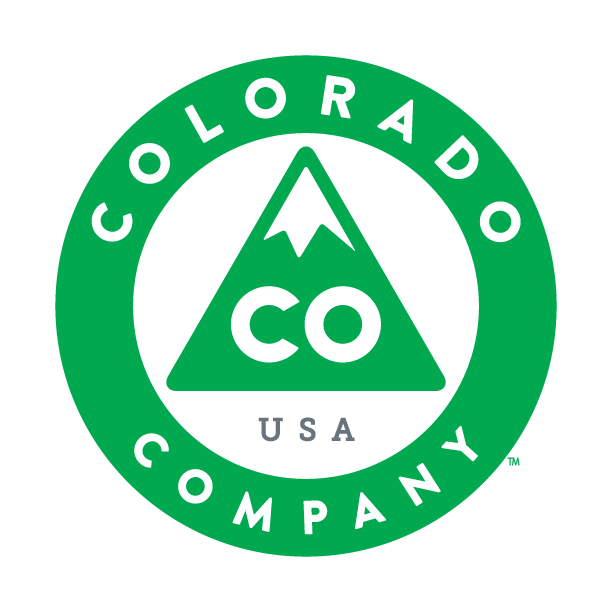 Fixed connection points are factory threaded fasten down points that are typically located on the outer edge of the roof at two points on each side. When not being use to attach a roof rack, there's very little sign of them. Typically, the connection points are located under a roof trim piece, a removable panel or a flip up panel. Once the threaded points are exposed a custom set of fasteners, bases and rubber boots interface between the vehicle and the foot pack and load bars. The system offers a very clean integrated look while providing a dependable platform for attaching a variety of carriers. Thule also offers two custom kits to interface with fiberglass truck camper shell toppers or sheet metal roof tops.